William H. Williams, knowing the railroad was coming through his property in the late 1870s speculated on people coming to the area and began selling lots ten miles west of Colusa. From this farsighted action came the conception of the town of Williams. It is interesting to follow the life of Mr. Williams westward and his activities to understand the type of man who founded Williams. William Henry Williams was born in Dorchester County, Maryland, to Mr. and Mrs. John B. Williams on April 7, 1828. He was the sixth child of a family of four boys and five girls. When Williams was about six months old he made his first move west, moving with his family to Pickaway, Ohio, about seven miles from Circleville. In 1835 the family moved a short distance to Darby Creek (about five miles from Darbyville, Ohio). He traveled westward four years later to Fulton County, Illinois, a thinly populated farming community. In March of 1850 at twenty-two W. H. Williams and three companions left Fulton County for the gold fields of California. In a wagon pulled by a team of oxen the party set off with all their supplies. Ninety days later the four men reached Carson River, then called ‘Ragtown.’ After the party stayed in Ragtown for a few days, Williams and nine other men again set off for the gold fields in California, taking the men six days to reach their destination. Williams tried various occupations. Although he tried mining for about three months, he made only $70.00 for all his labor. He then went to work for a store in Sacramento as a clerk on November 25, 1850, working for this store for $100 a month until July, 1851 when the firm sold out. Then Mr. Williams having bought a team of horses tried teaming for about a year, during which time he dragged and pulled wagons. In August, 1852 he bought twenty-two hogs at a cost of $1,000. Mr. Williams having made his first trip to what soon would be Williams in August 1851, returned later to the area to settle in Spring Valley and to begin the plans of the valley. At the time he moved into this area there was no farming. To experience with the virgin soil Mr. Williams planted some wheat and barley in 1854. The yield was from 20 to 27 bushels to the acre. His best yields came in 1856 with 50 bushels to the acre and in 1862 with 75 bushels o the acre. Mr. Williams stated that he thought that average was about 20 bushels to the acre. After coming to this area Mr. Williams started a family. In 1861 he married the first of his two wives, Miss S. W. Cary and had four children: Harriet, Laure, Lulu, and Ella. His second wife was an Irish waitress at the Williams Hotel, Mary E. McEvoy. Of their six children, four died before reaching eight months of age. Those children who lived were Belle and Marguerita. As of 1973, the only offspring still living is Belle, who is in a rest home in the Bay area. At the time Mr. Williams married his first wife, his estate was 7,360 acres, for which he paid $1.25 per acre. Of this land 3,500 acres was under fence. He also owned 1,000 Spanish Merino sheep, 20 head of cattle, 20 head of hogs, 16 head of horses. It appears Williams had a farsighted plan to increase his financial position. In February of 1876, Mr. Williams gave the railroad the right to build through his land. Already having the idea for a layout of a town ten miles west of Colusa, the county seat, Mr. Williams sent out maps showing the location and advantages to prospective buyers of the town lots. Town-lot purchasers flocked into the site of the town; building were rapidly erected; and when the railroad reached the new town on June 23, 1876, the area looked like a boomtown with building half erected buy, it was established and thriving. 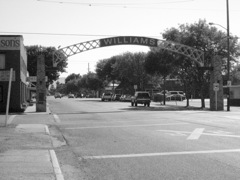 Originally named “Central” but was soon changed to “Williams” in honor of W. H. Williams, the town was established. Williams, unlike most boomtowns, seemed to be here to stay. The rapidly build building slowly changed to brick buildings. By 1876 W. H. Williams built the Williams home at a cost of $10,000 out of bricks hauled to Williams in wagons from Marysville. The W. H. Williams grain warehouse was constructed out of brick at a cost of $10,000 in 1875. The ventilated building of 170 feet by 100 feet is still standing and is the mail building for Endeman’s Feed store. As a result of Williams’ efforts to establish a town, other people joined in the development of the town. Another permanent structure came in 1876-1877 when the J. C. Stovall grain warehouse was built out of wood. J. C. Stovall, a large land owner like W. H. Williams had his warehouse built on the opposite side of the railroad tracks from Williams’ warehouse. Stovall’s warehouse was 600 feet by 60 feet, costing $12,000 to build. In addition a flour mill was constructed out of wood in 1878 by Messer, Stovall, Williams, Zummalt, Eakle, and Stanley (all prominent people of the town and large landowners). The mill, costing $16,000, was equipped with the most modern flour grinder to be found. It is interesting to note that although the mill burned down later, the grinder was not hurt and is now used by Endeman’s Feed Store to make pellets. At that time the town of Williams consisted of two hotels, two general merchandise stores, one clothing store, one hardware store, one drug store (which is still under the ownership of Fouch). Also, there were, one boot and shoe store, one tin smith, two millinery and dressmaking establishments, one barber shop, three blacksmith shops, one wagon manufactory, one flourmill, two grain warehouses. Other buildings included a public school and an opera stage-public hall over the Lev grocery store. As the town became more established the Stovall-Wilcoxen Company was formed. By January 10, 1890, P. W. and J. C. Stovall joined together with C. E., J., G. H. Wilcoxen, and J. R. Shelton. Since J. Wilcoxen, one of the partners had been a successful peddler in Caroll County, Missouri he came to Williams already very wealthy. Later the Stovall-Wilcoxen Company came to be a big grains operation. The mineral springs in the foothills brought a number of people to Williams. The big springs were Bartlett, Alan’s, Cook’s, Wilbur, Fouts, Hough and Sulphur. To reach these areas people usually first arrived in Williams by train, then took a stage ride that went once a week up to the springs. The name of this stage line at that time was Smith and Jones, its driver being Quigley. The other stage line was the Millers and Company, driven by the Miller brothers. With the coming of a newspaper and two churches, Williams became fully established. On August 18, 1887 S. H. Callen with the help of his wife Lulu Williams put out the first FARMER, a journal which carried just about every kind of information. Farmers relied on it to give them weather forecasts and big business men relied on it for the Stock Exchange. On August 1, 1890 S. H. Callen associated with the G. W. Gay in the ownership of the FARMER. Also at this time the Catholic Church was brought to Williams from Marysville. In Marysville it was situated in a German colony. The church still stands in the place where it was placed and is still being used at 8th and F Street. The land for the Catholic Church, as well as the Methodist Church, was donated by J. O. Zumwalt. The Methodist Church is still in the place where it was built, 9th and G Street. On January 9, 1877 M. P. Hildreth and H. Husted were the first elected town officer. A setback to the development was one of Williams’ major fires in 1885. The fire consumed a state stable of W. Miller, where the mules that brought mineral water to the train were cared for. Also, the fire destroyed Hannah’s’ Saloon, Peter’s blacksmith shop, P. B. Chamberlain’s Variety Store, and the Post Office. Advancement was made in 1912 by C. K. Sweet by establishing the water works. Prior to that time, nearly every house had a windmill to pump water into the houses and even with the water works few people took advantage of this service until later. Williams has become known as a leading community in the state in agriculture. This town has also grown from those few people who settled when the town was started to 1,719 people who function with an incorporated city government and a unified school system.